We will discuss travel, airlines, hawaii, travel agents, travel opportunities, hotels, airfare. We just returned from a a few days in Branson, Missouri. The weather was pretty good for this time of year. There were a few showers on the drive up but then the weather turned really nice the next couple of days. We had sunshine and tempeeratures in the 60's. I wanted to let you know about a couple of new things we did during the trip. The first was a trip to Chateau on the Lake for a spa day. This was very refreshing and invigorating. We did this on Friday during the middle part of the day and we practically had the place to ourselves. The service is very good and the facilities are unbelievable. For the price of an hour long massage at an upscale spa in the city we had the run of the place for about 4 hours. This included access to the steam room, dry sauna, indoor and outdoor jacuzzi, lounge with HD television and snacks, full shower facilities and amenities as well as an hour long massage. How could you not come out of there feeling relaxed and refreshed! Check out their website here . If you can't get away to Branson or the Chateau anytime soon check out this Spa Basket for Women . It will help you get away for a few hours and get that relaxed and refreshed feeling. We also had breakfast for the first time at the Belgian Waffle and Pancake House. We always say we are going to eat breakfast there but we usually end up eating the free breakfast at the hotel. This time we decided we would eat a late breakfast there on our last day. The service was friendly and the food was good. My wife and daughter had waffles. I had a traditional bacon and egg breakfast. My son had an omlette. Everyone said the food was good. Price was just slightly higher than an Ihop or Waffle House. Make a note here if you decide to eat there. They do not take credit cards or debit cards. They take cash and checks. The waitress said they would take a check from anywhere so if you are running a little short on cash and don't want to hit the ATM just write a check! Spring is almost here! Hasn't it been a cold, wet, snowy, winter? Well, spring break is just a few weeks away for most folks. For many it's in 2 weeks. You need to get your plans made now if you don't already have them. 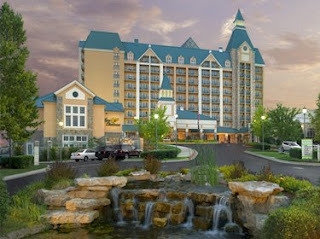 A trip to Branson can be fun and economical. There are many new things coming this year to Branson, Missouri in terms of entertainment and attractions. I will be outlining those over the next few posts. So, what are you waiting on. Get your plans ready now for Branson. Although I am a proponent for spending Thanksgiving with family for many folks Thanksgiving is a 2 day paid vacation tacked in front of a weekend. With 4-days to get away what better way to do it than spend it in Branson. Branson, MO is nestled in the Ozark mountains between Harrison, AR and Springfield, MO. It is a touristy kind of town like Gatlinburg, TN. Branson will be decorated to the max with Christmas lights everywhere during the Thanksgiving holidays. Branson and the surrounding areas are very beautiful, especially this time of year. If you were to spend Thanksgiving Day in Branson you would find many restaraunts and shopping outlets open. In addition there are going to be over 60 shows open on Thanksgiving Day in Branson. Of course you will need to find lodging and there are many hotels with fantastic rates for the entire Thanksgiving weekend. It's not too late to book your room and make your way to Branson for the Thanksgiving holiday weekend! Go ahead...what are you waiting for...an invitation? You got it. Just click the link below and book your room and any shows you may want to see. Then head to Branson and enjoy a long Thanksgiving weekend. I know many of you will be heading to Branson, Missouri to take advantage of the many shopping opportunities the day after Thanksgiving (commonly known as Black Friday). What many of you may not know is that many stores will be open at Branson Landing on Thanksgiving Day from 11am until 5pm. I am personally not a fan of being open on Thanksgiving day, however, if you do plan to arrive in Branson on Thanksgiving day before 5pm you will have the opportunity to get a head start on your shopping. You can also get started early at the Tanger Center Outlet Mall with their Midnight Madness Sale that starts at Midnight on Thanksgiving. Follow the link to print a page of the discounts being offered at the various stores in Tanger not only at Midnight but for the entire weekend. You will enjoy your trip to Branson not only because of the shopping but also because Branson, Missouri is beautifully decorated this time of year. It will literally be lit up like a Christmas tree. So take time to enjoy the lights of Branson. 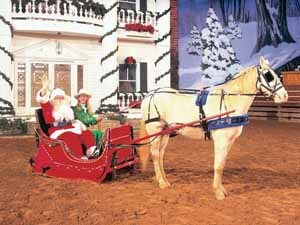 Maybe check out the Shepherd of the Hills Trail of Lights of the Old Time Christmas at Silver Dollar City. You can find out more about both of the these events by following the link below. If you haven't made your trip to Branson this summer you need to get it scheduled. Labor day is just a couple of weeks away and it's just about time for school to start back. We made a short visit to Branson a couple of weeks ago and stayed 3 nights. We had some relatives down from Washington state and they enjoy Branson and wanted to make a return visit. One of the things everyone wanted to do was to see NOAH The Musical. I will have to admit I didn't have extremely high expectations for the show. It did start off a little slow but it built up steam after the first 15 or 20 minutes and just continued upward after that. I don't want to put any spoilers in here but after intermission the stage setting that opens the last half of the play is unbelieveable. This is a very good show! The Sight and Sound Theater, where the show is performed, is very nice. There is plenty of parking, the climate control in the theater is good, the seating is good, and there are plenty of refreshments to purchase in the lobby before the show and during intermission. The only thing I thought could have been better was the capacity of the restrooms. Both the men's and women's restrooms had long lines during itnermission. Overall I would recommend attending this show. The ticket prices are comparable to other shows in the area and the 2nd half of the show really makes it worthwhile. Prices, including taxes, range from $53 for and adult, $25 for teens up to 18, and $16 for children ages 2 through 12. You can follow this link to get your NOAH The Musical tickets. Have you seen this? Can you believe this? They now have an airline for pets. Not for people who want to bring their pets, just pets! No cargo hold transportation for these pets...just first class treatment all the way. I will admit I don't have pets at the moment because I'm too busy to have time to care for them and give them the attention they need. But an airline for pets? I guess I'm just a little too old school. Do you have plans for the July 4th weekend? Are you looking for a great place to take in some fireworks shows? Well let me suggest Branson Missouri. Big Cedar Lodge which is one of the more popular resorts in the Branson area will be hosting a fireworks display at dusk on July 4th. Next door to Branson in Hollister, MO a fireworks display will be held at dusk on July 4th. This is one of the longest running fireworks displays in the Ozarks. It has been conducted for over 50 years. Can't wait until July 4th for your fireworks? Well, Branson Landing will be hosting it's 2nd annual Liberty Light Up Fireworks show on JULY 3rd. The program will kick off at 8pm with a concert in front of the beautiful fountain located in the the heart of the Landing. This is a choreographed fireworks show and it will be first class. Come early and shop and stay late for the show! If you are not native to this region of the country let me give you a couple of pointers. It will be warm outside. Actually before dark it will be hot. Dress appropriately. The temperature will likely be in the 80's after dark. And speaking of dark you can expect it to be dark enough for the fireworks by about 9pm. 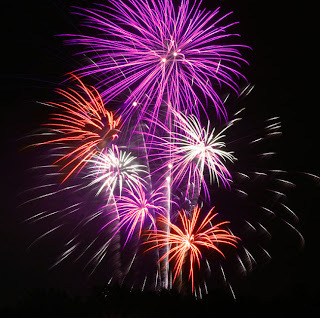 Most of the fireworks displays will be between 30 minutes and an hour in length. Be patient when the shows are over it will take a little time to get back to your lodging due to traffic.